Loon Ergo Fly Tying Tools, All Round Scissors, Dubbing Brush, Bodkin / Dubbing Needle, Razor Scissors, UV Power Light and Mega UV Light. 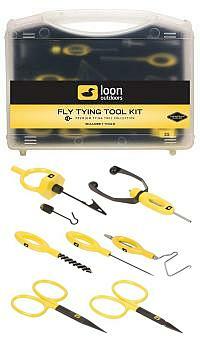 and Fly tying Tool Kit. Sets UV Knot Sense and Wader Patch on a dull day and even in the dark. This powerful Loon UV light is perfect for curing Loon's UV products either individually or at a volume rate. A push button on/off and a powerful beam makes curing UV products simpler than ever. One AA battery included.  UV light for curing Loon's UV products. 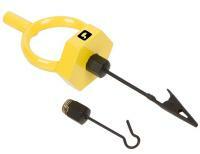  High intensity light for tying and bench applications.  Uses 1 AA battery (included). Small enough to carry in the field, yet powerful enough to use at the bench. The nano light can be stored in a wader or shirt pocket for curing Loons UV Knot Sense or UV Wader Repair, but is also an excellent option as an economical light for tyers just getting started with using UV resins. 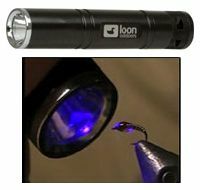 The most powerful UV light for fly tying, this is the best way to achieve a solid cure with all Loons UV curing resins. While indoors or shaded from the sun apply Loon UV product and form into the desired shape. To cure, shine UV Power Light on UV product. UV Product should be fully cured and hardened in 15 seconds. Packaged in a heavy duty travel case this is an excellent choice as a gift for the first-time tyer, or the long-time tyer who wants to trick out his or her bench with something new. 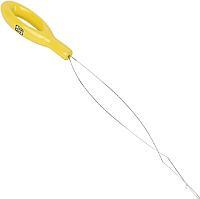 An oversized tweezer that does everything from picking up hooks and beads, retaining materials for even the largest dubbing loops/composite loops, and holding materials for dubbing brushes. Measures 7.25 overall. The ultimate dubbing spinner. Developed in partnership with the geniuses at Fly Fish Food, the Loonn Gator Grip Dubbing Spinner includes two tips for any spinning scenario a tyer might encounter from complex twists to dubbing loops. The octagonal anti-rolling technology ensures that the tool stays put on the tying desk, while the ring shape allows for smooth consistent tension while palmering. 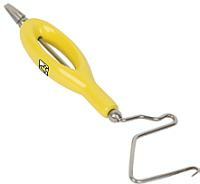 An extra-long bobbin threader that is compatible with even the largest bobbins. The powder coated body is bright Loon yellow, making it tough to lose on a bench. The only dubbing brush tool that youll need. The ergonomic powder coated handle feels great on the hands, while the nylon bristles and stainless steel helix spine are tough enough to tackle any material in need of a good crushing. There may be some debate over preference in scissor size and shape for the tying bench, but theres not a question about the importance of scissors being sharp. Very sharp. Consistently sharp. Every pair of scissors that comes through our facility is inspected then hand sharpened and then meticulously finished before being sent to our dealers. 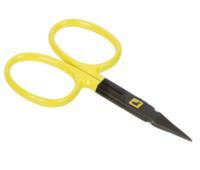 Loon Ergo Razor Scissor 4"
 Enlarged ergonomic finger/thumb holes.  Surgical quality stainless steel.  Excellent for large/tough materials.  Extra sharp cutting blades. 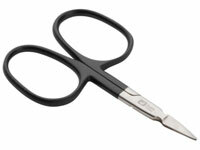 These precision scissors feature an ergonomic design and stainless steel blades. An excellent choice for quailty and comfort, the enlarged ergonomic finger/thumb holes allow quick and trouble-free access. 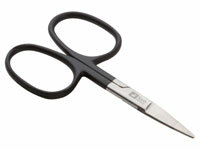 Re-designed, these precision scissors now have a new ergonomic design and stainless steel blades. An excellent choice for quailty and comfort. 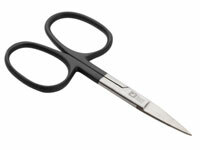 Redesigned, these precision scissors now have a new ergonomic design and stainless steel blades. An excellent choice for quailty and comfort. This powerful Loon UV light is perfect for curing Loons UV products either individually or at a volume rate. A push button on/off and a powerful beam makes curing UV products simpler than ever. While indoors or shaded from the sun apply Loon UV product and form into the desired shape. To cure, shine UV Power Light on UV product. UV Product should be fully cured and hardened in 15 seconds.